a forum for conversations about books, music, movies, and issues raised in the arts, media, and culture . . . with a spiritual slant! But HURRY! The deadline for ordering is July 31, 2008. 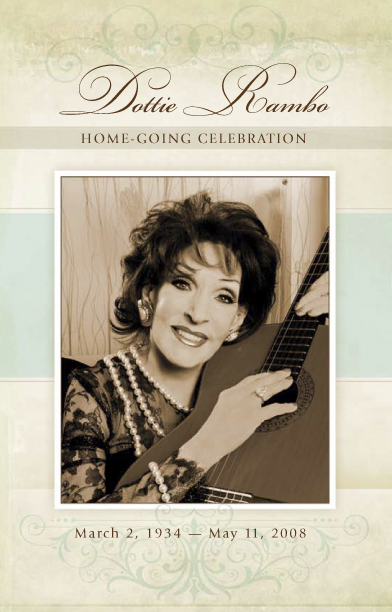 Can I still purchase a DVD of Dottie’s Home-Going Celebration? As far as I know there is no CD of Dottie’s Homegoing. Occasionally a DVD is available on ebay. You could call or email Reba and Dony’s church, The River at Music City, in Nashville and see if they still have any copies. That’s the best advice I have. No! I am just a Dottie fan like you. I have no connections. Welcome and Don’t Forget the Comments! Rest in Peace, Leader of the Band . . .